Lee Valley Tools is a local hardware/gardening/woodworking store. They don't sell the plants or the wood, but they do sell the tools. They have stores across the country, but somehow it still feels wrong to call it a chain, perhaps because they are still family-owned (I think!). 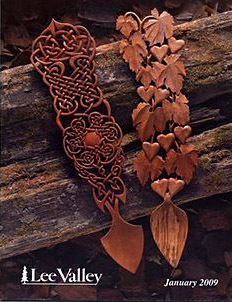 One of the latest catalogs to arrive in my mailbox has a most striking cover, and here's the story of the beautiful Celtic knot carved lovespoons (via). Chinese knotting demos at the Bangsar village, Kuala Lumpur, Malasia until Jan 24, 2009. More about the Museum of Fine Art, Houston (Texas) Korean art exhibit that I mentioned last week. I love the International Woman of Mystery (IWOM). She teaches, she shares freely, she buys extra supplies so that she can help those who don't know where to get them themselves.